Morgan rushes into the hospital with Savannah in his arms. She was shot in the parking lot in the last episode. Not Morgan. Hotch pulls Morgan off the case, on the grounds that he's a material witness in his wife's shooting plus he's been a target for the past six months. 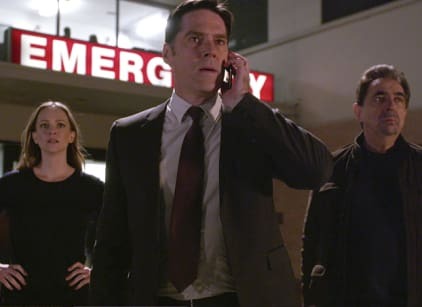 Hotch reveals there's a connection between the men who kidnapped and tortured Morgan and the Montolo crime family. Garcia pulls up footage from the shooting that shows Chas Montolo walking away. They had previously thought that Chas had been killed a year ago. It looks like he staged his own death. Garcia pulls up hospital footage that shows Chas Montolo made the phone call to Garcia that Savannah was shot. Montolo then looked directly into the camera with a smile. JJ pulls a note from the payphone that Montolo used, and shows it to Morgan. It reads "How does it feel? Do you see red? I see red." Morgan says he doesn't know what it means. Hotch confronts Morgan and again asks what the note means. He accuses Morgan of knowing but withholding. Garcia pulls up hospital security footage showing Morgan taking off from the hospital. Hotch calls him on the phone, but Morgan refuses to come back or say where he's going. Morgan tosses his phone so they can't track him. Morgan uses a key and lets himself into a house. He sees a series of monitors, all watching key places in the hospital. There's one over Savannah's bed, and another one watching the team. Montolo points a gun at Morgan's head, telling him that he has to check in every five minutes. If his gang doesn't hear from him, they're to start killing the people Morgan loves. He tells Morgan to empty his gun. Montolo accuses Morgan of killing his son when he was in prison. Morgan says he arrested him but didn't poison him. Montolo says he believes Morgan effectively killed him. He holds him responsible. Montolo empties his gun of all that one bullet. He points it to Morgan and asks him again if he killed his son. Morgan says he didn't. Montolo pulls the trigger, but there was no bullet in the chamber. Reid realizes that maybe Montolo has lured him to one of the properties that Morgan renovated. Garcia pulls up a photo of one of the properties. It has a red door. The team all leaves to go to the address. Montolo picks up a cell phone and calls Garcia. He tells Morgan to pick up the phone and say his goodbyes. Montolo puts a second bullet in the gun, and begins pulling the trigger again and again as Morgan talks to Garcia and the team. Morgan looks over at the landline phone. He grabs the gun from Montolo and pushes him to the ground. He tells Montolo his team was never in danger, because the house they're in doesn't have a landline. Montolo tells him to pull the trigger. Morgan comes close but refuses. The team arrives and arrests Montolo. Morgan makes it back to witness the Caesarian section birth of his baby boy. After making the decision to leave the BAU, Morgan says his goodbyes to his team. He and Savannah have named their baby Hank Spencer Morgan. "Hank" after Morgan's father, and Spencer after Reid. Morgan: I know you hate goodbyes, kid. And change. Hey, it isn't always a bad thing. Reid: I just can't imagine this room without you. Morgan: So don't. Don't think about it. Just know I'm always going to be by your side. I'm just a phone call away. I'm sorry I can't stay. Reid: I don't want you to stay, because I know why you're leaving and I couldn't be happier for you. Morgan: Well listen, we were going to mail these, but I wanted you to have a birth announcement first. Morgan: Yeah. Hank is for my pops. But Spencer is for the best little brother anybody could ever ask for. I love you, kid. Permalink: Two amazing bros say goodbye. As a good friend of mine said, every ending is also a beginning. We just don't know it at the time. I'd like to believe she's right.